A few weeks ago, we introduced a new DVD on this blog. 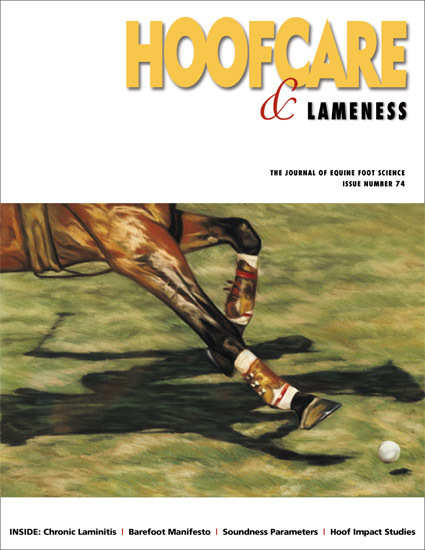 "Recognizing the Horse in Pain" is an interesting survey of subtle lameness problems in performance horses by Dr Joanna Robson, a veterinarian in the Bay Area of Northern California. In this little clip, you will see a few out-takes from the section on thermography from the video. 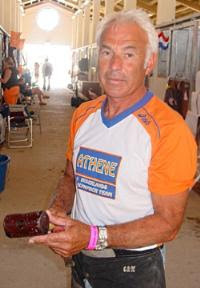 The Arabian ex-endurance horse was worked up at farrier Mike DeLeonardo's clinic in Salinas, California; his diagnostic protocol included scanning his feet with a thermographic camera, as well as radiographs. After reviewing all the images with Dr. Robson, Mike was able to come up with a change in the horse's shoeing that would make her much more comfortable. Dr. Robson's DVD "Recognizing the Horse in Pain" has been very popular and we will soon have the book that goes with it. If you'd like to order the DVD, it is $60 plus $5 post in the USA and $8 post to other countries. However, the DVD is only available in NTSC (North American) format which may not play in some DVD players in other countries. Click here to go the web page for the book or use the PayPal button to order directly. But did you know that roughly the same process used to identify gait abnormalities in a clinical setting is used to collect data points of horses for animation? Today's video takes you to a makeshift video studio on a riding arena in England, where a video crew is "filming" a white horse that will later star in a video game. Here's a rough cut of what the animators were able to re-create from the data points. So the next time you waste an hour playing Oblivion, just ask yourself where that horse got his moves. His moves might just be data points, plucked out of a riding arena by a geeky animation crew that could moonlight at an equine hospital, if they were so inclined. Farrier Family Portrait, Germany, circa 1900. Best wishes for a happy Thanksgiving from the Hoof Blog! I hope that you all have wonderful holidays with your families and friends and horses and dogs. I am most thankful for the opportunity to write for you and act as a conduit for new and old information. Most of all, I'm thankful for the friendships I've made with other professionals in the horse industry and I appreciate the way that you all keep me inspired. Enjoy your turkeys and your football games! Note: if things get slow today, I would refer you to last year's Thanksgiving blog post, which was one of our most popular ever: it revealed the long-forgotten story of the shoeing of turkeys. I will never top that one. Enjoy! Rood & Riddle Equine Hospital’s role as the Official Veterinary Partner of the Games will not be limited to providing veterinary support during the competition but will also include hosting educational forums for veterinarians and horse owners. Rood & Riddle, Alltech and the American Association of Equine Practitioners have joined forces to sponsor a sport horse symposium for veterinarians and another for horse owners, to be held in conjunction with the 2010 Alltech FEI World Equestrian Games, which opens September 25 at the Kentucky Horse Park in Lexington, KY. The continuing education program for veterinarians, titled “Promoting Peak Performance in Equine Athletes,” will be held from September 22-24, 2010, at the Marriot Griffin Gate Resort in Lexington, KY. An international roster of speakers will present in-depth, current information on orthopedic problems, diagnostic imaging, equine podiatry, lameness versus neurological disease, upper and respiratory disease, muscle disease, and nutrition with focus on the veterinary care as it applies to the equine athlete. Featured speakers include orthopedic surgeon Dr. Larry Bramlage, and internal medicine specialist Dr. Steve Reed from Rood & Riddle, and Dr. Kent Allen, Dr. Wayne McIlwraith, and Dr. Jean-Marie Denoix. A one-day horse owner workshop is scheduled for September 24, 2010 at the Embassy Suites in Lexington. The workshop will be conducted by veterinarians and nutritionists to provide horse owners, trainers, managers, and riders with valuable information for managing injuries and maintaining peak performance in the sport and performance horse. Registration will be available for both programs in June 2010. Final program and schedule information is expected to be ready for release in early spring 2010. A group of rooms will be available at the Marriott at a special symposium rate for veterinarians registered to attend. This information will be available on the Rood & Riddle, AAEP and Alltech websites with announcements distributed to multiple media outlets. In addition to these excellent programs, Rood & Riddle will also host hospital tours, short lectures and demonstrations throughout the weeks of the Games. Some of these offerings will be available in the exhibit area at the Kentucky Horse Park. Schedules and appointment information for these special events will be posted at www.roodandriddle.com in May 2010, and will also be promoted through other media releases. Equine Obesity Update: Do Horse Owners Comprehend the Dangers? There's no doubt that the horseowning public in the United States and abroad is becoming more aware of the problem of obesity in horses. Just look at the variety of new feed products and supplements designed to help horses lose weight, and you will see just the first wave of a marketing tsunami aimed at assisting horse owners in reducing the weight of the horses. The problem may not lie in just recognizing obesity, however. For many horse owners, telling them their horses are fat is akin to telling them that they have spoiled a child with candy. In their eyes, fat horse is a sign of a well-fed and much loved horse, but they may not connect the dots to the real health risks associated with obesity, such as insulin resistance and a high risk for laminitis. In this video, the British international charity World Horse Welfare updates us on their progress in educating horse owners and also in surveying horse owners for their perceptions of obesity in horses. You'll also see a severely overweight pony that was confiscated by officials as a welfare case because of its obesity. This was the first prosecution of horse owners for welfare violations directly related to overfeeding a horse. I love the last part, where the pony stands next to a pile of bags of feed equal to the weight he has lost. Thanks in advance for sharing this video and keeping public awareness of the dangers of equine obesity at the forefront. 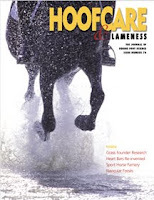 California sport-horse specialist Joanna Robson DVM examines problems of performance-related discomfort and subtle lameness in English and Western horses in this brand new 75-minute DVD packed with information on the effects of badly-adjusted or ill-fitted tack, lack of attention to saddle fit, poor condition in horses, and a long list of behavior and attitude problems that can be traced to musculoskeletal tension or pain. Chiropractics, acupuncture, electroacupuncture, thermography and farriery are just a few of the modalities that are touched on in this all-inclusive, holistic look at the horse in training. The filming is excellent and the horses are "real". As Dr. Robson says, these are the horses who aren't going to be helped by a prescription of "bute and stall rest". Their pain has a cause, and removing that cause will return them to the training regimen their owners and riders want them to follow. 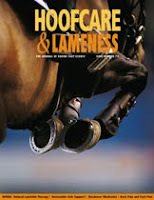 Note: This excellent DVD is no longer available from Hoofcare Publishing but hopefully you can find it elsewhere. 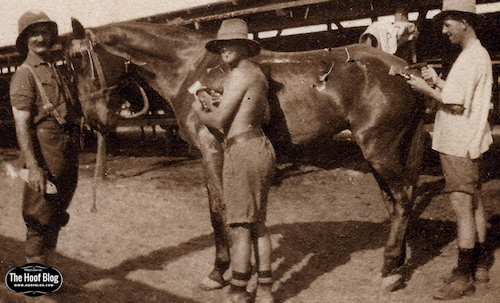 In the Middle East during World War I, horses arriving from Australia would have had winter coats and required clipping to withstand the heat of the desert campaigns. 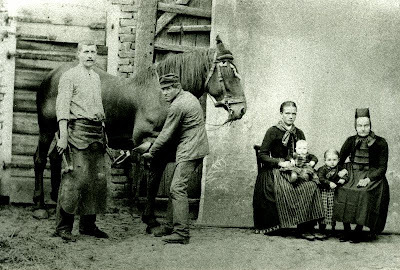 These men are using the hand clippers that were standard for the task at that time; it would take three men a long time to clip each horse, compared to today. The British military had horses in the winter mud in Belgium and France, and in the searing heat of Palestine. 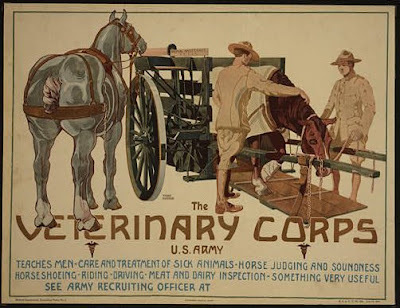 Clipping was a godsend for the desert, but what did mandatory clipping mean for the wet horses shivering on the Western Front? When war was declared in 1914, the British were not prepared. They had only about 25,000 horses and mules ready for war; they also operated five Remount Depots and four Remount companies, with a remount strength of approximately 1,200 horses and mules. They were going to need a lot more than that. And they needed them almost overnight. On the 11th hour of the 11th day of the 11th month, World War I ended. It was November 11, 1918. Here we are almost 100 years later, and the original "Armistice Day" has become "Veterans Day". A lot of people will hardly blink. Looking back to World War I, I found this very interesting poster that I thought I'd share with you. Someone designed a horse-drawn horse ambulance that made a lot of sense. The ambulance was rear-entry and front-exit, so that an injured horse never had to back up. I think that is brilliant. When the ambulance arrived at the stable or hospital, the pulling horse was unhitched and the injured horse led forward through the traces. The American Quarter Horse Association reported today that western breed and sport industry alliance partners reached a general consensus involving humane treatment and equine welfare during a meeting October 20 and 21 at the American Quarter Horse Hall of Fame & Museum in Amarillo, Texas. Attendees included representatives from the American Quarter Horse Association, United States Equestrian Federation, American Association of Equine Practitioners, National Cutting Horse Association, National Snaffle Bit Association, National Reining Horse Association, National Reined Cow Horse Association, United States Team Penning Association, American Paint Horse Association and Equine Canada. Meeting participants discussed the merits of developing a uniform therapeutic medications program and humane treatment policies that could be adopted by all of the groups involved. Executive directors from these associations scheduled a follow-up meeting for January 2010. All hail the supermare Zenyatta for her amazing, gutsy win of the Breeders Cup Classic yesterday. While her race will be replayed again and again for years to come, if you missed the race on television you didn't see the starting gate mishap that lead to Quality Road being scratched. Here's a YouTube.com clip of that portion of the race from the Partymanners racing archive. This footage would otherwise be lost to history, and includes an update from AAEP Veterinarian-on-Call Dr. Larry Blamlage of Rood and Riddle Equine Hospital in Lexington, Kentucky. I hate to see a horse in such distress anytime, let alone on national television. The gate crew are well-schooled in handling these situations but this horse--whom many of you will remember for his famous quarter cracks--narrowly avoided hurting himself, his rider and people on the ground. I know he is a very big horse and I was happy to hear that he is ok today. Irish champion Rip Van Winkle may be a bionic horse. He will run in Saturday's Breeder Cup Classic in spite of a history of hoof problems that would have sidelined many. His trip to California from Aidan O'Brien's training center in Ireland is the culmination of a stellar performance record in recent months...and the result of a concentrated focus at managing hoof problems so that the horse can have a chance to prove his worth. Traveling at the side of Rip Van Winkle is Ballydoyle training center farrier Michael O'Riordan. Eight horses made the trip from Tipperary, but it is Rip Van Winkle who occupies much of the farrier's time and concerns. In an interview this week, O'Riordan described the process of monitoring the hoof health of the Ballydoyle group. 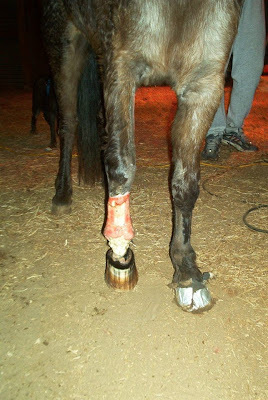 He provided more details about the horse's problems in the past, which he believes are related to some sort of structural deficiency in the horse's hoof walls. "He's a beautiful horse," O'Riordan told me. "He has near perfect conformation and is very free moving. He doesn't pound the ground when he runs so that's not it. "His hoof walls are so thin. I believe it must be a mineral imbalance of some kind that has weakened the wall." Rip Van Winkle's problems had O'Riordan on the problem-solving mission much earlier this year when he began using Yasha glue-on shoes on the horse for the quarter crack problems. When a wall separation compromised a hind foot, Ballydoyle brought in the Yasha shoe developer and quarter crack repair specialist Ian McKinlay, who traveled to Ireland to work on the hoof. Wearing Yasha shoes on his patched feet, Rip Van Winkle was able to race this summer and win major stakes races. This fall, a quarter crack in the fourth foot was a shock as the Breeders Cup approached. Over the past year, Rip Van Winkle has had his feet resected and rebuilt, his cracks laced. His feet have grown out and his hooves are now reinforced with acrylic. The new hind foot problem has been laced. How will Rip Van Winkle like the Pro-Ride surface? O'Riordan said that training on it has gone well. At home, the horse canters on wood chips and works on grass, and his stakes races have been on grass. Rip Van Winkle's Yasha shoes are cushioned Victory racing plates without toe grabs. O'Riordan said that most of O'Brien's horses had been switched to small toe grabs on their hind feet, but not Rip Van Winkle or Mastercraftsman. All the Yasha shoes have toe clips, front and hind. Rip Van Winkle has a normal size foot, a size 6 Victory plate. Mastercraftsman is also wearing the Yasha shoes glued to all four feet, but O'Riordan said that the shoes were put on that horse for comfort and that the horse has no problems and is a nice mover. He feels that the soft heels on the Yasha shoes are kinder to the foot and don't wear down the heels. O'Riordan's job this week is to keep an eye on the hooves of eight horses. He won't blink until Saturday's races are over. He'll head straight back to Ireland on Tuesday, but will hope that his trip includes the scenery of the winning circle at the culmination of the Breeders Cup Classic. "We wouldn't be here without the Yasha shoes and Ian McKinlay's lacing technique," O'Riordan stressed. "If you see paramedics in the winner's circle, you'll know they're reviving me," he joked. The Fifth International Equine Conference on Laminitis and Diseases of the Foot is pleased to announce that Molly the Pony will be receiving the Spot Courage Award at this year's event. Molly the Pony was rescued by Kaye and Glenn Harris after Hurricane Katrina, and is one of the world's only prosthesis-wearing ponies. The conference will be held November 6-8, 2009, at the Palm Beach County Convention Center in West Palm Beach, FL. "One of the first questions I am usually asked is how is it possible that Molly does not have laminitis," said Kaye Harris, Molly the Pony's owner. "Laminitis was the major fear and the reason the doctors originally did not want to perform the operation, so I think it is very important that there is a conference that researches ways to treat and cure this disease. I'm very excited to be accepting this award on behalf of the team of people that have taken care of Molly, as well as on the behalf of Molly. Molly is a very courageous pony and I'm thrilled to be coming here and meeting this group of people." 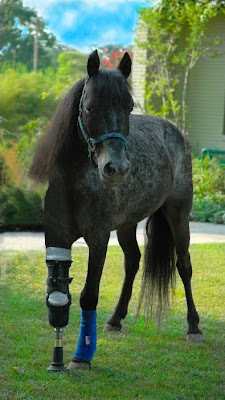 Molly the Pony will be receiving the Spot Courage Award on Friday, November 6, at 1 p.m. during the Conference. Dr. Rustin Moore will present the award to Molly and her owner, Kaye Harris. Following the presentation of the award Harris will speak briefly until 2 p.m. about her experiences with Molly. Following Hurricane Katrina, Molly was abandoned by her owners and taken to a rescue shelter. During her time at the shelter a pit bull terrier attacked her and it caused severe damage to her right front leg. Harris was taking care of Molly at the time, and turned to the equine hospital at Louisiana State University (LSU) for help. Dr. Moore performed the rare and difficult surgery involving amputation and a prosthesis to offer Molly a new chance at life. After her traumatic experience, Molly has gone on to be a symbol of hope for those in difficult situations. Molly the Pony is a children's book about the pony and her experience, providing inspiration for thousands. The book will be available for purchase during the Conference, and Molly the Pony will be making other appearances at local children's hospitals during her visit in Florida to spread her message. 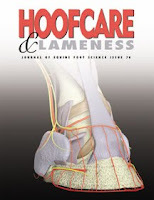 The goals of the Fifth International Equine Conference on Laminitis and Diseases of the Foot are the better understanding, prevention, and treatment of laminitis and other diseases of the equine foot. The format includes scientific and practical tracks with topical sessions, followed by small group practical workshops providing information that attendees can incorporate into their daily routines. The Fifth International Equine Conference on Laminitis and Disease of the Foot brings together the world's experts and visionaries on laminitis to create an innovative, educational, and entertaining program for conference attendees to help educate the public and further the fight against laminitis. The Laminitis Conference is led by its Director, Dr. James A. Orsini, DVM, DACVS, a faculty member at the University of Pennsylvania and Associate Professor of Surgery in the School of Veterinary Medicine. For more about information about the Fifth International Equine Conference, please visit: http://www.laminitisconference.com. Do You Speak Farrier? 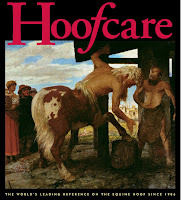 The 2010 New Dictionary of Farrier Terms Will Help! Cost is $19 plus $4 postage in USA; $8 elsewhere. 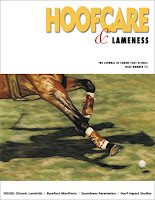 This little slide show from author David Millwater gives a preview of the new edition of the outstanding reference, New Dictionary of Farrier Terms. We have always tried to make this book available over the years, but the book is now all grown up, with a spine, glossy cover and expanded listings. I hope this book will become the accepted reference for defining farrier words so that authors and editors can all speak the same language. I don't always agree with Dave, but he is such a good writer and a diligent compiler of the lexicon of his profession that I don't mind losing out to him (sometimes). Farriers will (or should) know all the terms in the book, but may be stuck sometimes to define what a London pattern anvil is or what "interdigitate" really means in the laminar bond. This book will help. For everyone else, this book helps de-mystify the language of the back of that truck and the furthest corners of the smithy. It won't cure your horse or keep your shoes on, but it will help you sound like you might know what you're talking about. How you string the words together is up to you! The New DFT belongs on the shelves of authors, editors, translators, veterinary hospitals, educators, lawyers, insurance companies, breeders, trainers, horseowners, merchants and, of course, libraries. Did I forget anyone? I hope the sales from this spiffy new edition will encourage David Millwater to continue his calling as a word detective and delve more into the origins of farrier terms (one more time: why do they call it canker?) and that this project will flourish and my arguments with him never end. Take my word for it: if we all agreed, Hoofcare's world would be a much less interesting place. ox at top right of blog page). The Forum, in this case, would be the Ninth Global Dressage Forum, held last week at the Academy Bartels training center in Hooge Mierde, the Netherlands. And the funny thing was that a farrier was a speaker at this event for the first time, and no one thought that unusual at all. What's more, they paid extremely close attention to his advice. The farrier? I can only think of a few who can hold the attention of an arena full of dressage experts, many of whom would be testing their own opinions against the farrier/speaker's. But no one can argue with this farrier's results. Horses from many countries shod and/or trimmed by Rob Renirie have won an amazingly consistent stream of Olympic, World, and European medals for the past ten years. He jokes about it, pokes fun at his clients, but has taken care of the horses they've asked him to keep in tune with the ground. No, Hoofcare & Lameness was not lucky enough to be in Holland for Rob's lecture, but we have friends all over the world and some of them were very helpful at this event. Astrid Appels of EuroDressage.com has written an excellent summary of Rob's presentation on her web site, and I would encourage you to go there and read the entire article (and see the photos). While Rob is best known for his Olympic gold medalist client Anky Van Grunsven, he cares for the hooves of many of Europe's top horses and travels with the Dutch team to international events. He also works with veterinarians on a regular basis, both on sport horse injuries and special clinical cases. "The frog is important for the blood supply and to absorb shocks. You have to leave it as big as possible and leave the bars in. The sole is as thick on the toe as on the heel. You have to leave the toe as thick as possible." "The coronet band determines the shape of the shoe." (Referring to Adelinde Cornelissen's successful European Championships dressage horse) "Parzival had flat underrun heels and the wrong shoes. He is wide in front and narrow in the heel. We worked on him a few times and the horse had a tremendous recover in his feet." Rob restated his sentiment from lectures in 2007 at the laminitis conference in Palm Beach that side clips are undesirable and can distort the wall. "They get too tight on the feet." "Do not correct the feet, but protect the feet." "We keep our horses as prisoners in a stable, which is not good for the blood supply." Rob restated that his own horses are not shod and that he feels that is the best way for a horse to be, qualifying that advice for horses that don't have hoof problems and are not moved between radically different surfaces. After the lecture, a group of attendees had a special opportunity to enter the stables of Dutch team rider Imke Schellekens-Bartels, and review the hooves of some of the horses at hand. Note: Rob has a web site, though there's not much on it. There is some nice music and some images of his work and especially his fabulous shoeing van and some scenes from his worldwide travels. Click here to go to Rob's web site; just click on the photos at the lower left and they should begin to change.